Renatus Laennec (Francogallice René-Théophile-Hyacinthe Laennec, aliter Laënnec; natus die 17 Februarii 1781 Coriosopiti in hodierna praefectura Fine Terrae; mortuus die 13 Augusti 1826 apud Kerlouarnec eiusdem praefecturae) fuit medicus Francicus qui propter stethoscopii inventionem clarus est. Roguin, Ariel. 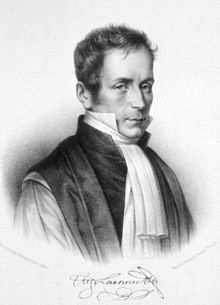 "Rene Theophile Hyacinthe Laënnec (1781–1826): The Man Behind the Stethoscope." Clinical Medicine and Research 4.3 (2006): 230–235. Novissima mutatio die 10 Iulii 2017 hora 13:17 facta.